We’d love your help. Let us know what’s wrong with this preview of Gravity by Andy Briggs. The second installment of The Inventory did not disappoint or lets its predecessor down. Lots of action, lots of twists, a little bit more depth to the characters. It upheld its side of the story nicely, look forward to the next one. this was a great thriller which has many twists and turns and is part of a good series. I was thrilled to get my hands on a copy of Gravity as I loved every word of Iron Fist. And book two does not disappoint! Strap yourself in for a thrilling rollercoaster of an adventure, as you travel all over the world with Dev, Mason and Lot, determined to stop the bad guys and save the world! Once again the science is fascinating and astonishing, the inventions that the trio use on their mission to retrieve the artefacts stolen from the Inventory are both genius and terrifying! I must admit to I was thrilled to get my hands on a copy of Gravity as I loved every word of Iron Fist. And book two does not disappoint! Strap yourself in for a thrilling rollercoaster of an adventure, as you travel all over the world with Dev, Mason and Lot, determined to stop the bad guys and save the world! Once again the science is fascinating and astonishing, the inventions that the trio use on their mission to retrieve the artefacts stolen from the Inventory are both genius and terrifying! I must admit to hoping that everything in this series is complete fiction and there isn't an Inventory hidden somewhere, full of inventions that could potentially end life as we know it! Andy Briggs is an outstanding storyteller, one that takes you by the hand from the first page and pulls you deep into his awe-inspiring world. You find yourself racing from page to page, chapter to chapter, barely catching your breath, as you desperately navigate this incredible journey into the unknown, never sure what you will encounter next, and what horror our three young champions will have to deal with each turn of the page. I have recommended Iron Fist to the year Five Teachers at my children's school and they are reading it at the moment, with the intention of using is to teach a topic as part of the curriculum early next year. Another fantastic book by Andy Briggs, I for one can't wait to read book three!! After finishing Iron Fist I was eager to make a start on Gravity, wondering what invention would the team be searching for and how dangerous it was going to be. After the events of Iron Fist, Dev, Mase, and Lot are now tasked with retrieving the items that were stolen from the Inventory, with the Avro and a backpack of gadgets they must work as a team and recover the items as they are found, from stolen jetpacks to Newton's Arrow. 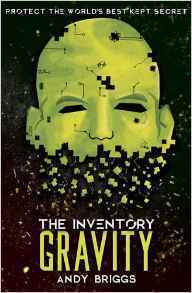 Gravity is a very aptly named book, as the invention they have to After finishing Iron Fist I was eager to make a start on Gravity, wondering what invention would the team be searching for and how dangerous it was going to be. After the events of Iron Fist, Dev, Mase, and Lot are now tasked with retrieving the items that were stolen from the Inventory, with the Avro and a backpack of gadgets they must work as a team and recover the items as they are found, from stolen jetpacks to Newton's Arrow. Gravity is a very aptly named book, as the invention they have to recover actually controls the gravitational force, with some pretty serious consequences when its used for the wrong reasons. I really enjoyed getting to follow the team as they travel to Tokyo to hunt down Newton's Arrow and stop Shadow Helix from completing thier task. Seeing what Newton's Arrow was capable of was freaky but also pretty awesome.....for a reader and not for the person on the end of the arrow. We get to see how Charles's mind works in the pages of this book as he interrogates the Collector for information about the stolen objects but also gives things away which prove to be disastrous later on. I liked that we get to see Dev using his ability more as he learns more about himself and who he is. The team itself is starting to function slightly better, as teenagers go its going well, and while the missions aren't picture perfect and they do slip up, I like the trust they have with each other, even if that means sticking together through the worst of it. I liked the progression of Gravity, following the ups and downs of the retrieval mission, seeing all the damage that Newton's Arrow can do, as well as it's true purpose. I loved getting to spend time with the characters again, even though I've only just left them, and even though I've read the books straight after each other, it doesn't get boring or repetitive. A British writer who works extensively in Hollywood and more recently in comic books. Hero.com and Villain.net are his first books launched in June 2008, with their sequels HERO.COM: VIRUS ATTACK and VILLAIN.NET: DARK HUNTER are out now - and more in the series coming next year. The books are available in UK, Canada, New Zealand, Australia and South Africa. Next year they will be out in: USA, Czech A British writer who works extensively in Hollywood and more recently in comic books.